As promised, here’s a picture of my stash and a heads up on the titles to come in Waila Reads. Please, refrain from insulting my picture taking skills. I have many talents but photography isn’t one of them! The last time I was in Lagos and wanted to buy books, someone suggested I go to the CMS bookshop as they supposedly stocked a large variety of books at competitive prices. I dragged my friend Moin-Moin all the way to CMS and I tell you, if I’d had a cane, I’d have flogged the staff out of the bookshop, locked it u and thrown away the keys. It was that useless. This time around when I asked, everyone recommended The Palms mall in Lekki. All the books I picked up last time, I picked up from The Palms so I didn’t question their knowledge. 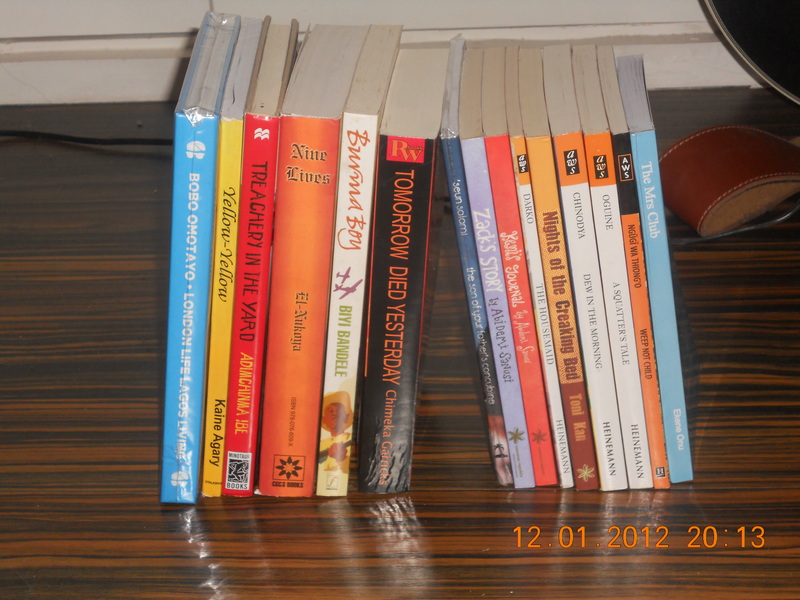 The day after I bought most of my stash, I had lunch with a friend at Terra Culture on Tiamiyu Savage and discovered they have a library/bookshop there…and books there are cheaper than at The Palms. I didn’t do the Maths but I’m pretty sure the savings I could have made would have been enough to buy me another two cartons of Indomie. Yes, I know, I bought another copy of Tomorrow Died Yesterday. The last pair of hands that housed my old copy must have left its doors open for rats to enter. Some people just never learn to shut doors. I keep saying I will stop lending out my books to people because many of them never find their way back to my bookshelf and some of the ones that do, escaped from rat infested hands. I’m currently reading 26A so it lay hiding in my handbag during the photo shoot. Have you read any of them? Tell me! Tell me! I’m trying to decide which one to read next. Happy Thursday people. May Friday come quickly and Sunday, slowly! Js got thru Yellow-Yellow.An OK read I would say..
told you i read the Mrs. Club right? Found it entertaining to keep it simple… exploring everyday issues sorrounding mature single women…one can definitely relate! Hey I know you did this post in January, but I just found your blog today! Have you read all the books yet? Nights of the Creaking Bed didn’t do it for me either. I just finished ‘Yellow Yellow’ and like you, was a little disappointed. I felt the story never really started. That said, I thought it was worth reading. ‘Nights of The Creaking Bed’ didn’t do it for me either and I’m yet to finish 26A, gave up a few pages in. I’m currently reading “The Spider King’s Daughter” by Chibundu Onuzo and so far so good!